My grand find today is the original Chick-fil-A sandwich. Hardly a unique find, you may say, since everyone knows how it feels when you just gotta have one. My new “find” on the old classic came on a Sunday after church when my grandson wanted to go to Chick-fil-A for lunch. And that’s when I realized that Connie Francis and the Cathy’s (founders of Chick-fil-A) have something in common. We had just passed a billboard with some cows dressed in fire-fighting clothes, climbing ladders with hoses, when Cole started giggling. I was impressed with his keen sense of humor at understanding the joke about the new spicy chicken sandwich and tried to measure my words when he asked me why Chick-fil-A was not open on Sunday. I explained that the people at Chick-fil-A want to give their workers the day off on Sunday so that they can rest and go to church if they want to. My grandson quickly noticed that other eating establishments were open on Sunday. I told him that some businesses feel that they need to stay open on Sunday because people still have to eat and that businesses can make a lot of money by staying open. He pondered this information and came to the conclusion that Chick-fil-A had the better idea to which I wholeheartedly concurred. But can anyone tell me why I so often want that bird on a bun on Sunday? Is it just my nature to want what I cannot have? Did Connie Francis know this little secret all along? 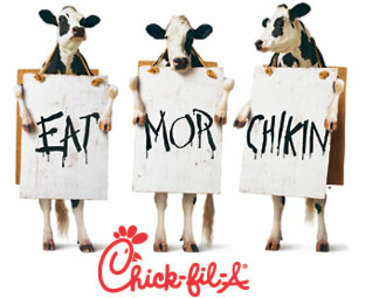 We love Chik-fil-A and have on a few occasions forgotten what day it was and DARN they are not open…we’re all for observing the sabbath, but certainly someone of a different faith could be working. Isn’t it a sin to not be open constantly to provide somewhat nutritious, fast food to those culinary-challenged?